This is the very best of West Coast Canada! This romantic cottage has it all. So private, yet close to all the excitement of Ganges Harbour. The famous Saltspring Weekend Market is a 2 minute stroll away. Wonderful art galleries, restaurants, shops, pubs, studios are all within a wander from your private sanctuary in the trees. Beach access is directly on the property. There is much to do here for all ages. On the property, there is plenty of exploring to do, and the 300 feet of private beach front to enjoy. A vast variety of birds and other wildlife make this 4 acre property home. Watch the swans, eagles, hummingbirds, quail and other exotic birds from the beach and expansive veranda. Raccoons, otters, deer and other critters are curious, safe and plentiful. Off the property, hiking, kayaking, sailing, golfing, fine dining, casual dining, patio drinking, swimming, shopping, scuba diving, a day at the spa, fishing, yoga, farmers markets, etc... are all close at hand. I guarantee you will love your stay here as much as we do! This house is operated by the Island Heritage Appreciation Club which allows members to use it to cover the costs. Membership is open to all those who appreciate well-maintained heritage properties. I'm a city boy from Vancouver, who has always dreamed of enjoying and maintaining an island heritage property (You don't so much 'own' such a property as take your turn looking after it) Traveling is in my blood, but I love the natural wonders and serenity of the Gulf Islands of British Columbia more than anywhere else I have been privileged enough to visit. An environmentalist at heart, I am sensitive to keeping this property chemical free and the house as healthy a living space as possible. We fell in love with this late 19th century estate when a friend bought it many years ago. Every opportunity to visit that came up, we made it a priority to get there. When it came on the market, I just had to try for it. This is one of those properties that changes your life in so many ways, and all of them for the better. Once you arrive at this property, you no longer need your car. Everything you need is within close walking distance. But when you enter and close the gate behind you, you are in a private world all your own and the outside world ceases to exist. It is the very best of all worlds! very close to downtown Ganges. you don't need a car to explore town or get supplies or hit a restaurant. you can walk along the beach on this property. Small covered deck at the front of the cottage off the living room. Larger open-air deck out the back off the bedroom and kitchen. This freshly renovated and beautiful cottage/cabin is the private gate house to a grand heritage estate. It is tucked to the side of the property where you will have all the privacy you desire, but it is close to everything in this enchanting and historic village of Ganges. I had a wonderful stay at this Oceanside cottage. It had everything I needed and was very comfortable. The caretakers were super great to deal with and very accommodating. I would definitely recommend staying here. I stayed for two weeks during January. Perhaps during the summer when there is more traffic and more people out and about, it would be more noisy being close to a busy road. I actually chose this place because of the location being close to all the shops, grocery stores and restaurants. Within walking distance to everything. Beautiful wooded lot! Convenient location to all restaurants and shops. It was a sweet little cottage. We appreciated the beautiful cut flowers that welcomed us on arrival. From the moment I walked in the door to the moment I packed up and said goodbye, I had nothing short of an amazing stay at the cabin. It was filled with a beautiful warm and inviting energy, and I felt right at home. 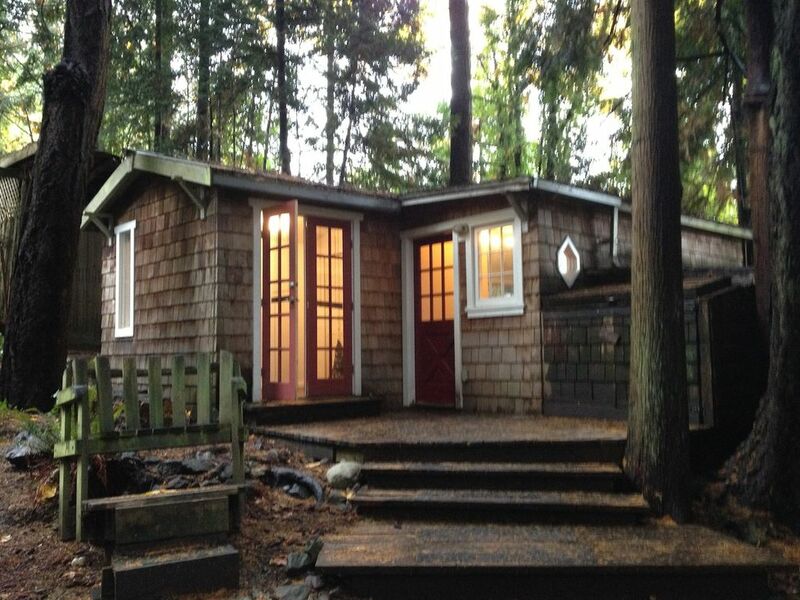 The cabin had all my needs, and was perfectly situated on the edge of town and by the water. Michael was a pleasure to communicate with over email, and Tara & Don were an absolute delight to meet! They were very friendly, polite, and ready to help me with any and all of my needs. My visit to Salt Spring was longer overdue, and I would definitely stay here again. The only thing that I would recommend for improvement would be to add bug screens for the windows so I could enjoy more of the lovely fresh air. We enjoyed staying here but it is rather small for a long stay. Also it is rather dark would like more sunshine. Wineries, organic farms, yoga retreat and drop ins close by, many artist studios, farmers market and fair, book stores, video rentals, antique stores, clothing stores, restaurants and delivery, pubs, heritage museums, music venues, theater, old fashioned movie house (current movies though). When you are on this very private property you would never know that this is all at your doorstep. Standard rates apply to all holiday weekends, whenever they happen to fall. Standard rates also apply to Christmas and New Year season from Dec 21 - Jan 5. We can be flexible with pricing only at the beginning & end of High Season. Every usage, long or short, has a $50 maintenance charge.